This vintage oval frame, that had been painted black, was being thrown away at the thrift shop. My mom rescued it and gave it to me a long time ago. I love old oval ornate frames. Empty, or with mirrors or photos. This frame has raised plaster flowers, and other great detail as well. First off, I painted the frame with my "old" go-to-paint, Rustoleum Heirloom White latex paint. I used it as an empty wall frame for a while. Then after I became a blogger, I saw chalkboards everywhere. Many other bloggers used Rust-Oleum Chalkboard Brush-On Black Paint or Rust-Oleum Black Chalkboard Spray Paint on glass. I purchased an oval piece of cut glass, at a local specialty glass shop, and painted it with several coats of chalkboard paint. I don't think I got a really smooth application, but this was my first time! You can tell by my chalk letters above. Lots of brush strokes visible in the chalk sign. Since I wasn't super pleased with my amateurish chalkboard, it quickly was placed into storage, in a closet. I pulled it back out of the closet last week and repainted the frame black again, with Rust-Oleum Painters Touch Latex in Flat Black . Yes, it went back to black! But this time I painted over the black base coat with chalk paint, Chalked Paint in Chiffon Cream . 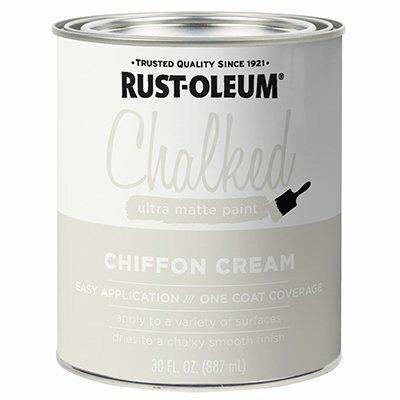 Chalked, is a knock off Annie Sloan Chalk Paint that is pretty darn good. I like the way it distresses with sandpaper and with a wet rag, and I like the coverage. I wet distressed the frame with a wet tee-shirt scrap. Wet means wrung out but not damp dry. I rubbed fairly hard on the raised areas and applied less pressure on the inner frame areas. Oh, goodness, I love this much better than my plain Jane Heirloom White frame. If you are scared to try up-cycling with chalk paint and distressing! Just look where I started out! Since I still was super unhappy with all my chalkboard brush strokes on the glass, (and I hardly EVER changed the message on the chalkboard), I turned my chalkboard into a faux chalkboard sign. 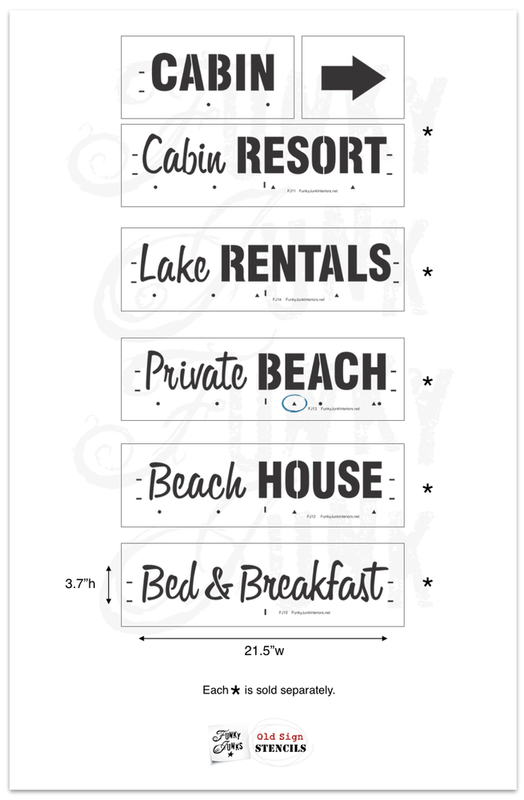 I pulled out my "Bed & Breakfast" stencil from the *Old Sign Stencils Getaway Collection! The cursive font is awesome! **Old Sign Stencils provided me with complimentary samples. I didn't sand the chalkboard paint or re-coat it or anything. I simply wiped it with a damp cloth. 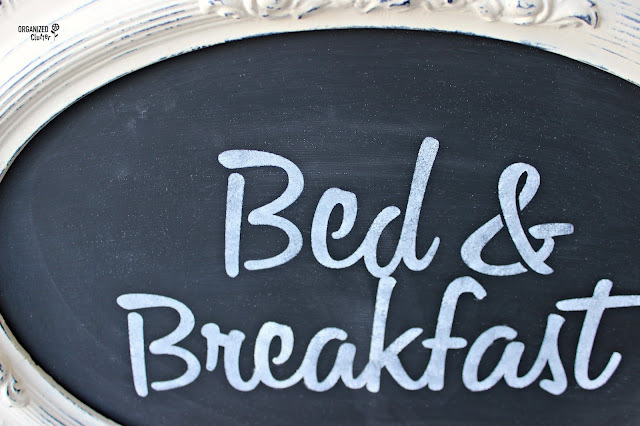 But before I put the glass chalkboard back into the frame, I stenciled it with the Bed & Breakfast stencil and Ceramcoat Select Multi-Surface Paint in Ivory . Ceramcoat Select Multi-Surface paint doesn't need sealing for indoor use. I used a wax brush to seal the chalk paint with Minwax Paste Finishing Wax in Natural. This project is so much more polished! I have so improved. 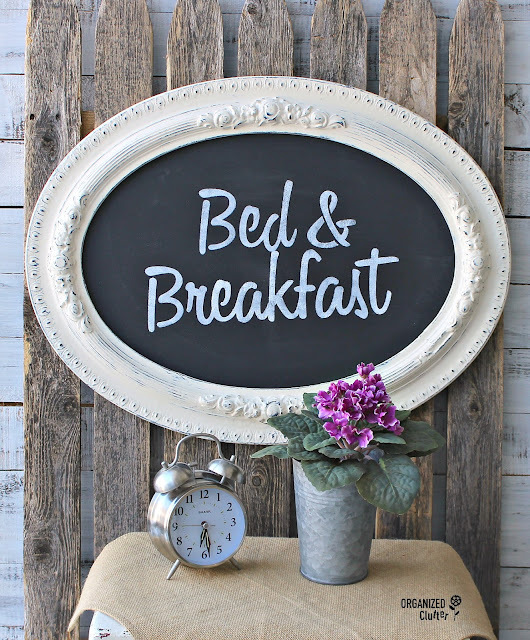 I think I have always been creative, but the addition of stencils (with practice) and chalk paint (that sticks to almost everything) made a lot of my projects possible! YOU too can learn to up-cycle and re-purpose! 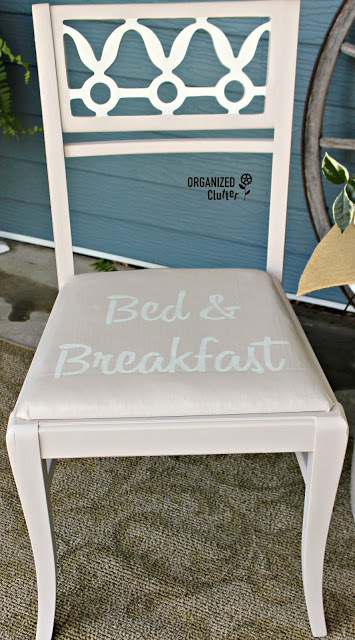 With chalk paint, with stencils, with a few hand tools and power tools! 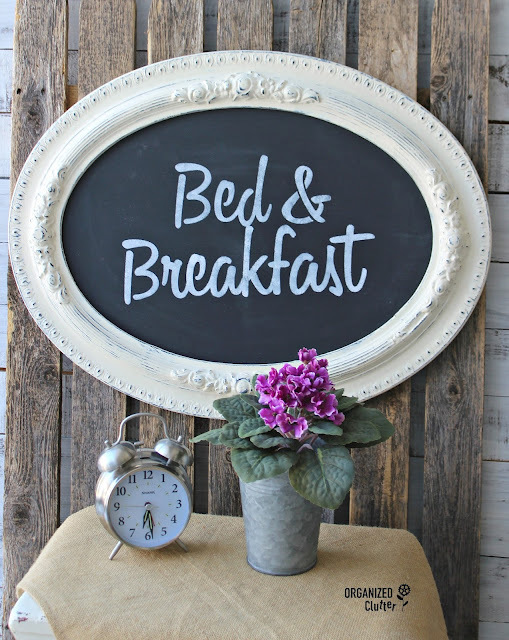 Upcycle & Repurpose thrift shop and garage sale items with ME! Pinned another great idea Carlene. I have been re-doing some of my signs (Donna does that too which is where I got my idea) and re-chalk painting and stencil with something else. I've featured this in this weekend's DIY Salvaged Junk Projects. Thanks for linking up!